The Cambridge Writers’ Workshop is delighted to announce the New York City debut of Amahl Khouri’s play, “He She Me” at the New York Public Library (18 W 53rd St) on June 22 at 7 pm. Amahl Khouri is a Jordanian playwright based in Munich, Germany, and one of Rita Banerjee’s students at the Munich Creative Writers. In her documentary play, “She He Me,” writer and director Amahl Khouri describes the complex living situation of transsexuals and homosexuals in the Arab world. She portrays Randa, a transsexual Algerian woman who is persecuted for LGBT activism and flees to Sweden. Omar, a gay man, moves in hetero- and homosexual communities in Amman and talks about expectations in Jordan’s patriarchal society. And Rok’s story begins with his despair at not being able to tell his mother that her daughter is now a son and ends somewhere in New Jersey. “She He Me” is about discrimination of trans- and homosexual people and about the issue, independent of gender, of what it costs to remain faithful to yourself. A selection from “She He Me” was published in Brooklyn Rail in English, and premiered in Arabic and German at Münchner Kammerspiele 3 on December 17, 2016. 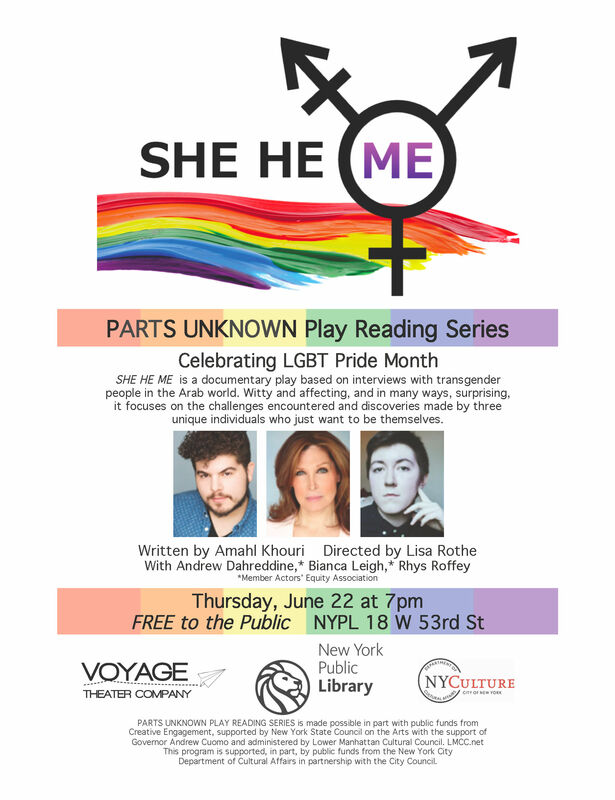 Parts Unknown will perform “She He Me” at New York Public Library (18 W 53rd St) on June 22 at 7 pm. The play is directed by Lisa Rothe and stars Andrew Dahreddine, Bianca Leigh, and Rhys Roffey. Admission is free.